I am applying for a provisional patent on this apparatus. Gold Galore Pan: TM is a trademark design for a new and improved type of gold retrieving apparatus. The trademark design of Gold Galore Pan: TM has new & improved features over and better than a gold pan to improve mineral washing and particularly to mine gold dust and nuggets from rocks and sand with improved separation and collection of the heavy gold ore from the wash. The new design in which an exclusive property or privilege is claimed from a traditional gold pan to the trademark design, titled “Gold Galore Pan: TM” are defined as follows in the paragraphs #1 to #5. [#1] A new gold panning apparatus wherein the Gold Galore Pan: TM is made of a rigid material like medal or hard plastic. [#2] A Gold Galore Pan: TM as set forth in paragraphs # 1 wherein the apparatus is a half circle trough that is 18 to 24 inches long and 6 to 9 inches in diameter. [#3] A Gold Galore Pan: TM as set forth in paragraphs # 1 and #2 wherein the apparatus is corrugated from one end to the other end of the trough. The corrugations are about 1/2 inch deep and about 1/2 inch wide and travel the length of the trough. There are about 17 corrugations per 12 inches. The corrugations are perpendicular to the sides of the trough. 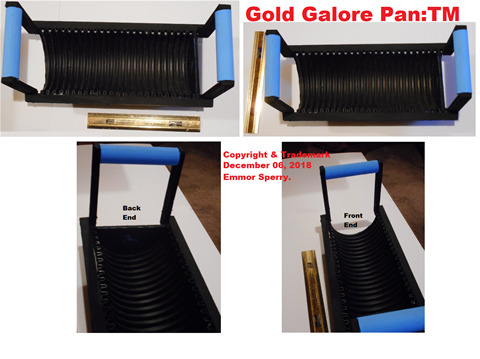 [#4] A Gold Galore Pan: TM as set forth in paragraphs # 1 and #2 and #3 wherein the apparatus has a handle at both ends of the trough.The handles are fastened to the sides of the trough and are about 3 to 5 inches above the top of the trough end. The handles are also perpendicular to the sides of the trough. This trademark design relates generally to mineral washing apparatus and particularly to a gold recovery apparatus with 5 improvements used to mine gold dust and nuggets from rocks and sand with improved separation and collection of the heavy gold ore. It has long been known that particles of gold could be found in sand and gravel of stream and river beds. And that the specific gravity between gold and sand could be used to separate the gold particles from the sand, gold is about 19 times heavier than water and sand is about 2 or 3 times as heavy as water. A gold pan was devised comprising a frustum, inclining sides closed on its smaller end by a flat bottom. Placing an amount of gold bearing sand and gravel in the pan with water. The pan is then moved in a circular motion with the pan sidewall inclined slightly below horizontal to wash away light sand material. With the water moving on the pan sidewall without excess spillage, a swirling action washes the mineral matter with the large and lighter matter being washed off of the pan and the gold stays in the bottom of the pan. Do to the design of a traditional gold pan a person/miner has to bend over forward or kneel down in or beside the cold water of a creek or river in order to pan for gold. This results in mussel tiredness and mussel strain. A person/miner must empty his gold pan to look for gold flakes or nuggets at the end of every pan full of sand and gravel that is being worked. In view of the foregoing disadvantages inherent in the known types of gold pans now present in prior art, the present trademark design provides a apparatus wherein the same may be improved to effectively increase amount of gold obtained in a given amount of time and it is accomplished with less effort. With the design of Gold Galore Pan: TM a person/miners hands can stay out of the cold water. This enables a miner to process much more gold bearing material in a days work. There has thus been outlined, the more important features of Gold Galore Pan: TM in order that the detailed description thereof that follows may be better understood, and in order that the present contribution to the art may be better appreciated. There are, of course, additional features of Gold Galore Pan: TM that will be described hereinafter and which will form the subject matter of the claims appended hereto. Those skilled in the art will appreciate that the conception, upon which this disclosure is based, may readily be utilized as a basis for the designing of other structures, methods and systems for carrying out the several purposes of the present trademark design. It is important, therefore, that the claims be regarded as including such equivalent constructions insofar as they do not depart from the spirit and scope of the present trade mark design, titled “Gold Galore Pan: TM” . than gravel or sand; it will always try and settle at the bottom point of tangency, as the trough is agitated with water or under water. The lighter ore mix is run out of the trough. The purpose of the foregoing, is to enable the public, and practitioners in the art who are not familiar with new trade mark designs, to determine quickly from a cursory inspection the nature and essence of the technical disclosure of the apparatus . The foregoing is intended to define the trade mark design of the Gold Galore Pan: TM, which is measured by the claims, it is not intended to be limiting as to the scope of the trade mark design in any way. It is therefore an object of Gold Galore Pan: TM to provide a new and improved gold recovery apparatus which has all the advantages of the prior art and new and improved advantages. It is another object of Gold Galore Pan: TM to provide a new and improved gold recovery apparatus which may be easily and efficiently manufactured and marketed. It is a further object of Gold Galore Pan: TM to provide a new and improved gold recovery apparatus which is of a durable and reliable construction. An even further object of Gold Galore Pan: TM is to provide a new and improved recovery apparatus which is susceptible of a low cost of manufacture with regard to both materials and labor, and which accordingly is then susceptible of low prices of sale to the consuming pubic, thereby making such panning apparatus economically available to the buying public. Another object of Gold Galore Pan: TM is to provide a new and improved Gold recovery apparatus wherein the same is formed as a gold recovery apparatus that increases the effective manner of recovery for gold. These together with the various features of novelty which characterize the trade mark design, are pointed out in claims that are forming a part of this document. For a better understanding of the trademark design, reference should be made to the accompanying drawings and descriptive matter in which there is illustrated preferred embodiments of the design. FIG. 1 is perspective view of the trademark design. FIG. 2 is a side view illustration of the trademark design. FIG.3 is a top view illustration of the trademark design. With reference now to the picture/drawings, and in particular to FIGS. 1,2&3 thereof, a new and improved gold recovery apparatus, titled “Gold Galore Pan: TM” embodying the principles and concepts of the present trademark design are enclosed. Gold Galore Pan: TM is for effecting an increased ease of operation and increase volume to enhance use by miners; for use in lakes, creeks and river water gold recovery. As to the manner of usage and operation of the trademark design, the same should be apparent from the above disclosure and accordingly no further discussion relative to the manner of usage and operation of Gold Galore Pan: TM shall be provided. The foregoing is considered as illustrative only of the principles of Gold Galore Pan: TM. Since numerous modifications and changes will readily occur to those skilled in the art, it is not desired to limit the trade mark design to the exact construction and operation shown and described, and accordingly, all suitable modifications and equivalents may be resorted to, falling within the scope of the trademark design. Example: I envision folding & locking handles. Enclosed within and as part of this document is a picture of a working prototype of the trade mark design titled “Gold Galore Pan: TM”. Thank you for submitting your registration claim. The following files were successfully uploaded for service request. case# "17201748991".